It was a long Black Friday as WW2 was reenacted beginning during the Spring of 1942. 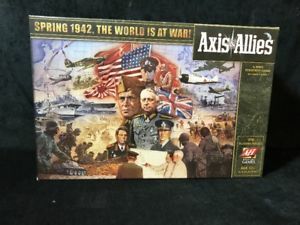 We have a number of different versions of Axis & Allies and it is always a surprise which version we are going to play. 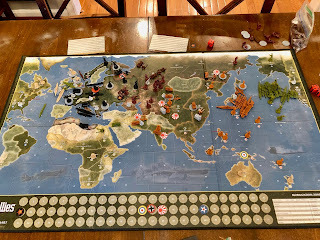 The Axis definitely had the advantage with Russia on the ropes and the US struggling to get into the fight. But with each passing round the Allies began to gain ground and when the game was paused so that we could watch Tiger and Phil, the situation on the ground was beginning to turn in favor of the Allies. The US was about to eradicate the Japanese navy and Russia was clinging to the faint hope of rescue by the UK. It was a classic Black Friday game. This year, for the first time, Ethan joined and wound up playing Japan. I was saddled again with Russia--a tough way to start since Russia is in the middle of the action. The Caucuses and Karelia saw most of the action on the Eastern Front. Well the game isn't over. It will have to be continued later. We stopped after about 6 hours of solid play. We took pictures of the board so that we could set everything up and finish the struggle.